For five decades NORAD has been tracking Santa Claus has he makes his way around the world on Christmas. NORAD has teamed up with Google once again to help pinpoint Santa’s location on the globe using Google Maps, Google Earth in 3D, phi-res Santa Cam videos and updates for mobile devices. This year NORAD is also posting Santa updates on Twitter, just follow @noradsanta. 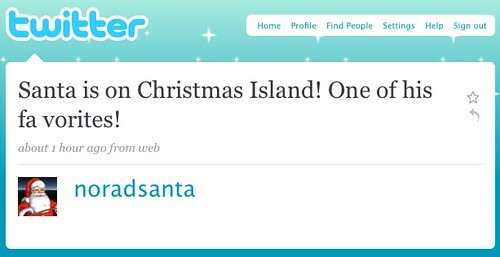 You can also follow Santa himself on Twitter at @SantaClaus.